Already own CINEMATIC GUITARS INFINITY? BUNDLE UP New to Cinematic Guitars? 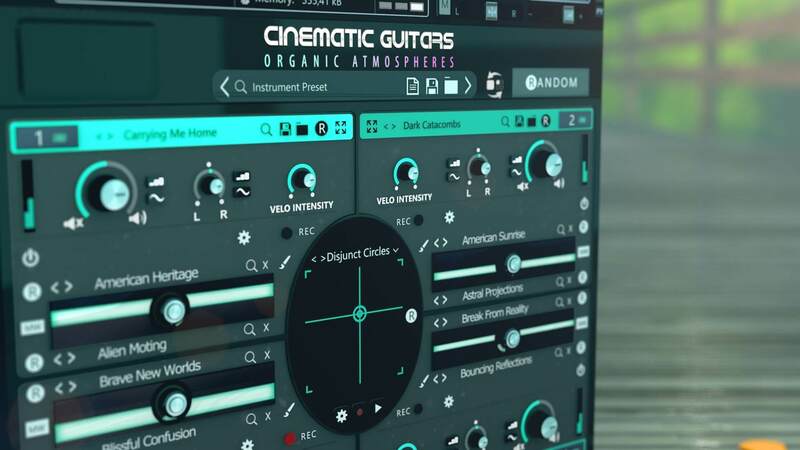 Get the world’s ultimate cinematic guitar virtual instrument collection by bundling CINEMATIC GUITARS ORGANIC ATMOSPHERES with Cinematic Guitars Infinity. Together these products now for only $699.99! 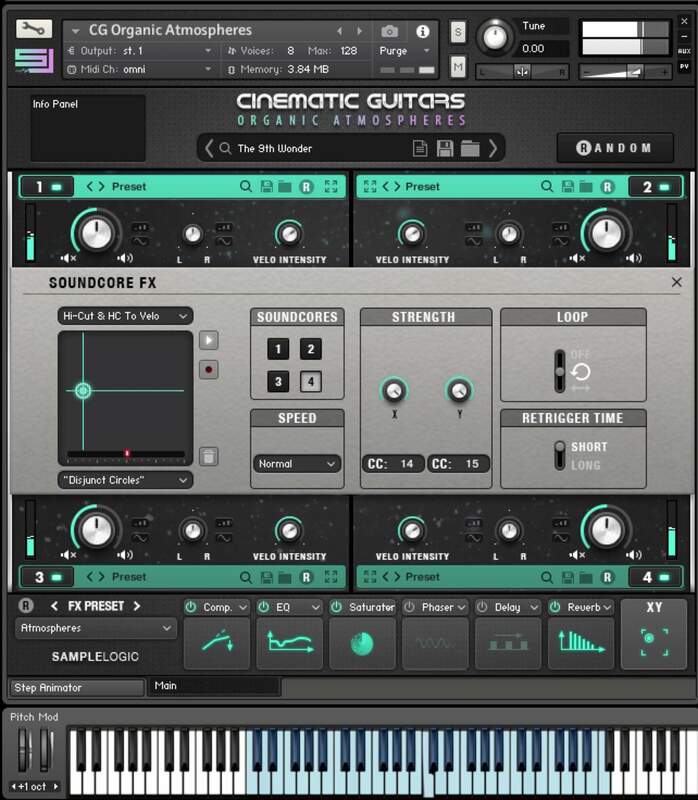 THE WORLD’S MOST POWERFUL CINEMATIC ATMOSPHERE VIRTUAL INSTRUMENT! WHAT IS CINEMATIC GUITARS ORGANIC ATMOSPHERES? 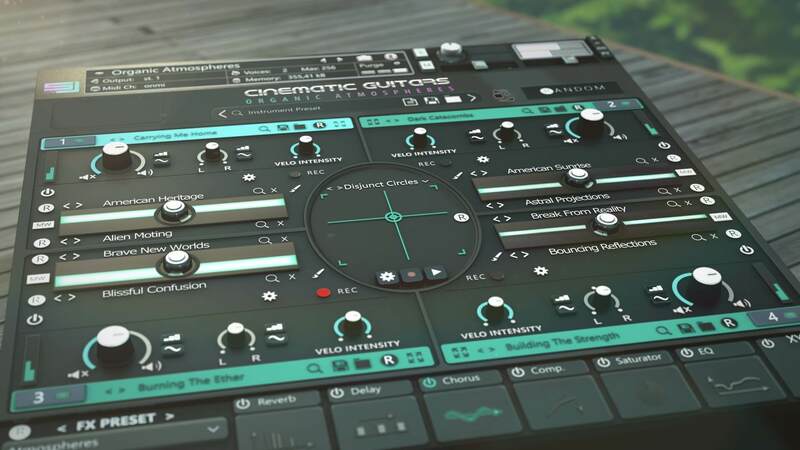 CINEMATIC GUITARS ORGANIC ATMOSPHERES is your all-in-one cinematic atmosphere solution. Powered by Native Instruments Kontakt Player, this definitive collection advances the legacy of the CINEMATIC GUITARS family by delivering samples and presets aimed squarely at organic atmospheres and soundscape creation. Derived entirely from recording real acoustic guitars of all shapes, sizes, and styles, CINEMATIC GUITARS ORGANIC ATMOSPHERES allows for an astronomical array of diverse, organic sounds in inventive ways emphasizing both the natural and earthy tones of realism and the imaginative world of cinema. All are a perfect fit for its inspired nomenclature. Needless to say, an inspiring individual was tasked with creating all the original samples from a suitably sizeable guitar collection — composer, performer, and producer extraordinaire Steve Ouimette, namely... famed for his Guitar Hero exploits. Exploiting his extensive knowledge and adventurous performance styles, Steve Ouimette rose to the occasion, creatively crisscrossing countries and continents with a diversity of unprocessed recordings ranging from Southern, Southwest, Bluegrass, and Old Western to the Pacific Islands and traditional varioys Asian genres using unique instruments such as the 4-string Cigar Box guitar, Baritone guitars, bowed and traditional Ukuleles, Puerto Rican Cuatro, Marx-O-Chime, Dobro, Purgatory Hill Harp, Silvertone Archtop, and much more. 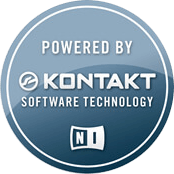 Beyond that, this truly magical material was duly developed by the Sample Logic team to create a wide range of all things organic and acoustic-sounding, bringing breathtaking soundscapes to the discerning DAW (Digital Audio Workstation) user — Standalone mode operation notwithstanding, of course! From blissful and lush, dark and mysterious, bombastic and edgy, to bowed, plucked, and strummed, those 850-plus presets — produced from 5GB sample content — collectively cover much musical ground, ranging from simple and stationary textures through to complex tempo-synched sonic animations. All are but a click away, while those seeking an adventurous atmospheric experience like no other with a more personalized touch can craft their own original soundscapes in a mere matter of seconds! Time to unlock your creativity and launch amazing atmospheres into the world with CINEMATIC GUITARS ORGANIC ATMOSPHERES...an almost limitless number of sonic combinations are available to you and your musical muse. 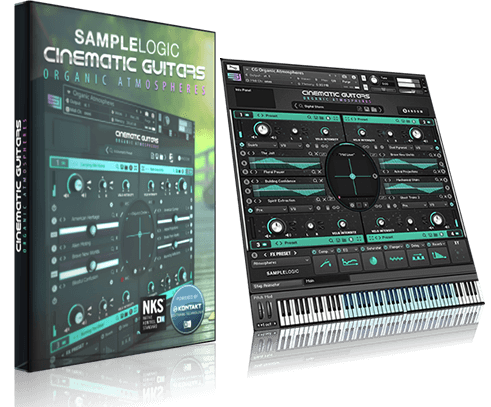 Sample Logic has helpfully equipped over a dozen parameters within its innovative interface for randomization soCINEMATIC GUITARS ORGANIC ATMOSPHERES users can quickly tap into trillions of starting point combinations with creative effects. Effortlessly arm the randomization feature, prepare to fire! The interface’s intelligent randomization technology will generate instantaneous inspirational results — every time! CINEMATIC GUITARS ORGANIC ATMOSPHERES makes creativity simple, ensuring effortless design of infinite atmospheric soundscapes. So who and what do its users have to thank for that, then? 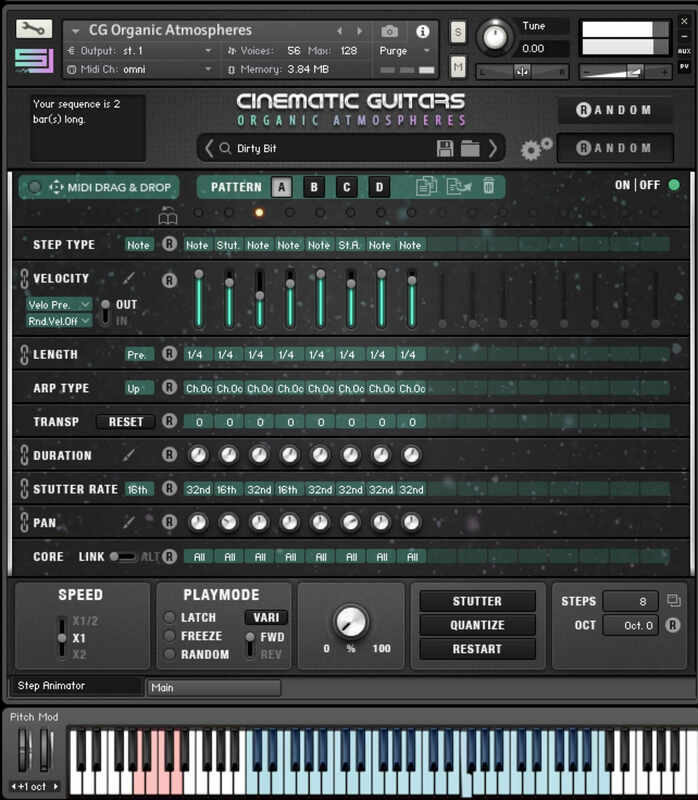 By being built on Sample Logic’s dynamic MULTI CORE engine, CINEMATIC GUITARS ORGANIC ATMOSPHERES allows up to eight simultaneous SOUNDSOURCES to be stacked and shaped via four SOUNDCORES (with each SOUNDCORE capable of playing back two SOUNDSOURCES simultaneously), so starting with the seed of a soundscape then working outwards with the intuitive interface can quickly spiral into massive sounds! Such sounds need not be static, however, but can be infinitely evolving, thanks to the power and free-flowing creative combination of the XY slider and 3D Mixer. 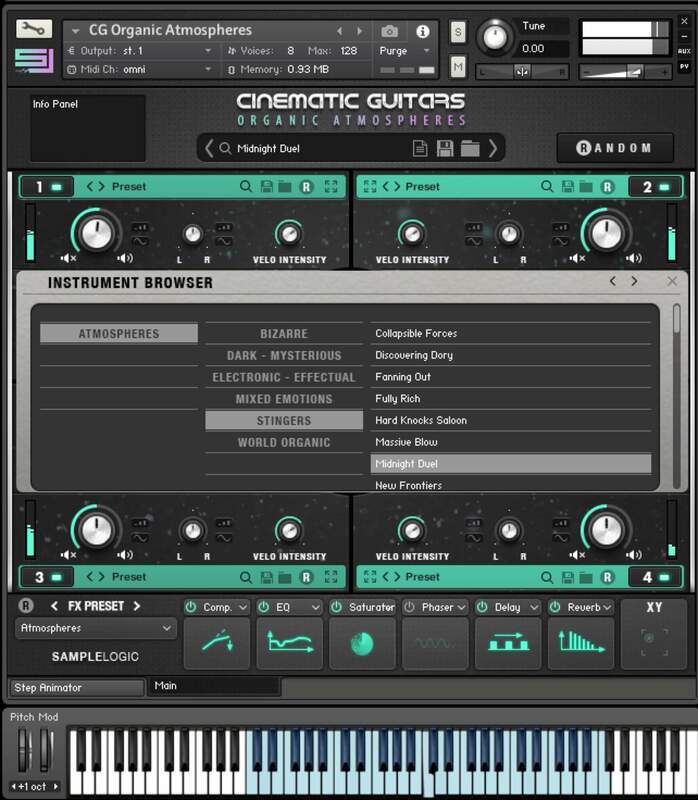 Mixing sounds in CINEMATIC GUITARS ORGANIC ATMOSPHERES makes for a new kind of KONTAKT user experience for sure — simply drag the crosspoint along the XY axis to smoothly blend between four SOUNDCORES, while the 3D Mixer is so much more than a balancing tool with an axis that can be linked to effects parameters that can also be animated with Sample Logic’s proprietary STEP and MORPH ANIMATOR to take things to an even higher plane of organic soundscape creation consciousness! Why stop there? 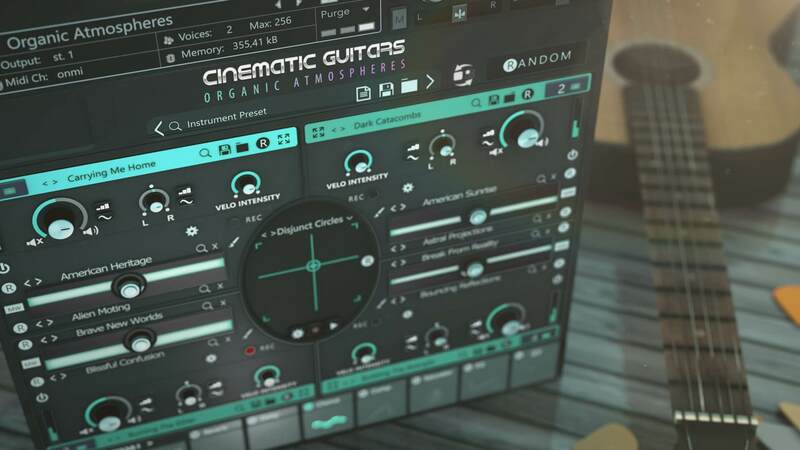 CINEMATIC GUITARS ORGANIC ATMOSPHERES has been designed to work seamlessly with Native Instruments’ MASCHINE and KOMPLETE Kontrol software and hardware controllers, providing more control and faster browsing. 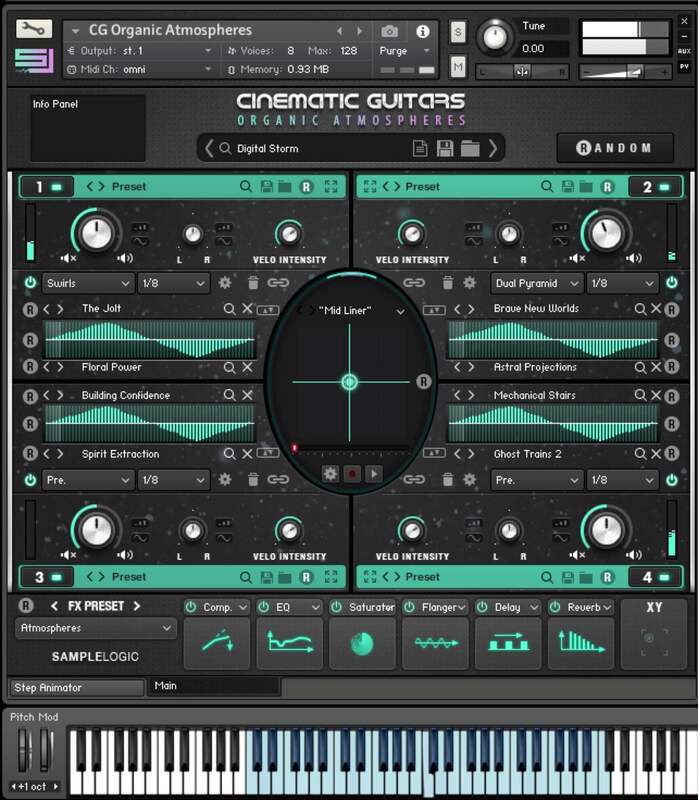 Speaking of effects, CINEMATIC GUITARS ORGANIC ATMOSPHERES comes complete with dozens of fully customizable effects presets with hot-swappable SOUNDCORE and MASTER FX chain technology to die for. Fortunately, there is no need to feel trapped by a prescribed effects chain ever again as chains can be built and reordered in realtime from a selection of over 20 studio-quality effects including Compressor, EQ, Saturator, Phaser, Delay, Reverb, and many more. CINEMATIC GUITARS ORGANIC ATMOSPHERES includes over 300 soundsources, 300 soundcores, 250 multi core instruments, and a 5 GB compressed sample library using Kontakt’s lossless sample storage compression. All samples are delivered at 44.1kHz/24-bit. Having this library of great atmosphere’s and textures in your tool kit is very handy for the TV/Film composer. Its such a great way to build and inspire new cues. Im already using it in my score. I love all of Sample Logic’s instruments! They are deep, interesting, and capable of an astonishing array of musical textures and atmospheres. Their tradition of great quality continues with CGOA. I’ve just added another great tool to my palette! With CGOA it seems to me that the sound designers at SampleLogic have taken an intergalactic mission in order to bring us back sonic treasures from the edge of the universe. Musicians-save money on your future voyage to Mars because obviously these guys have been there and back. Wow- incredible sounding.